As discussed in the initial "qualitative" review of the first season, my reaction to the series was a surprise. Long and short, the fantasy genre has never been my cup of tea. The sentiment has not changed but as evidenced in the the last three Literature Society posts, I have thoroughly enjoyed the series in its written format. 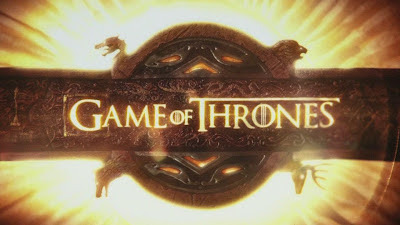 When I completed the novel that the series was based on, I decided to watch Game of Thrones: Season I and compare to the source material (Noteworthy is that I talked Lady Funkowitz into watching with me and surprisingly enough she enjoyed it). This show is the best thing on HBO currently (Until Deadwood comes back in any form) and this is speaking as person who has watched the show from both sides (Having read the book and not). The plot to the show is quite complicated and as seen from my previous review (and the subsequent book reviews), it is highly difficult to provide a proper synopsis of the plot. In the world which the show resides, there are seven kingdoms united under the rule of King Robert on the Iron Throne. 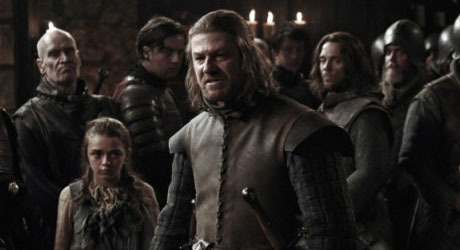 Robert requests that Eddard "Ned" Stark replace their mentor as the Hand or chief advisor to the King. "Ned" quickly realizes the folly of accepting that position and gets caught in the "game of thrones" (hence the title). The Crown is at the mercy of the Lannisters from the perspective of gold to make the government work. Moreover, Robert's wife, Cersei Lannister wants him dead and pretty much rule in his stead. Once the King dies, it sets in motion a series of events that will bring the seven kingdoms to war. The strength of this show is how the adaption was handled. How the writers crammed enough of the plot into ten one-hour episodes and left the emotional structure of the series intact is nothing short of astounding. An example is the opening scene of the series and the prologue of the book. They are mirror images of each other and played out exactly how I imagined them in my noodle. It is funny how apparent the editing becomes when you have read the book. This is not a bad thing, it simply illustrates how the writers where able to condense the seven hundred plus pages into ten hours. While the writing is top notch, the main reason for watching this show is the acting. 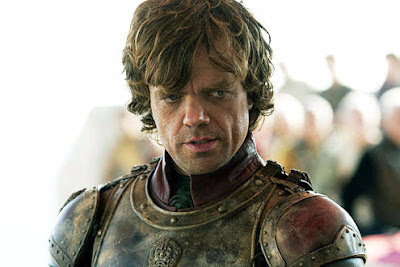 In the previous review, I praised Peter Dinklage for his portrayal of Tyrion Lannister and it is not surprising that he took both a Golden Globe and Emmy for the performance. Honestly, I could spend a lot of time discussing Dinklage and Sean Bean but it would be doing a disservice to a cast comprised of unknowns and people with small roles in American cinema/ television (Mark Addy, Lena Headey and Charles Dance to name a few). Overall, Game of Thrones is quite close to its source material and this is not surprising David Benioff's ability to adapt novels (He wrote the novel and the screenplay for 25th Hour, which I think is a forgotten piece of Spike Lee's filmography). Having come into the books very late, I have come to see how fervent the fan base is and I think the positive critical response speaks to the writing staff's attach to the detail (and nuance as well) of George R.R. Martin's books. I mentioned earlier that the show surprised me and I was astounded by how I felt watching season I again. Usually, when I watch a series for a second time, I find that I did not like it as much as I did before (Cough, cough... Lost and Dexter) and for that reason I do not typically revisit television (Except for Deadwood or Six Feet Under, which stand the test of time). However, I left the last episode of season I with the same level of enthusiasm that I had the first time I viewed it. Needless to say, it drove my desire to read the second book, A Clash of Kings. Speaking of which, the second season of Game of Thrones (based on A Clash of Kings) begins tonight and the excitement in the Funkowitz house is palpable. Hopefully, it lives up to expectations. We shall see.